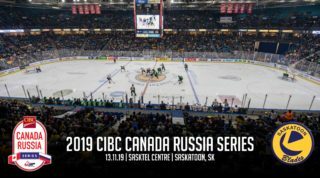 Regina, SK – The Saskatoon Blades offense exploded early Wednesday night leading to an eventual 6-4 rout of the Regina Pats. After giving the Pats 10 power plays in their last meeting on Saturday, the Blades tightened up as planned and killed off the only two minor penalties taken in the game. Saskatoon’s power play also went 1/3, scoring in their 2nd consecutive game. 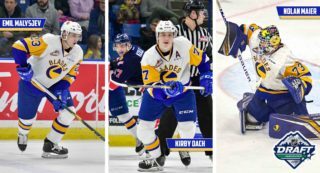 The Blades are now 2-4 on the season and will take some much needed confidence into Alberta this weekend visiting Medicine Hat and Red Deer on Friday and Saturday. Libor Hájek opened the scoring 4:50 into the hockey game just as time expired on a Regina penalty. Hájek redeemed himself after taking a hooking minor 14 seconds into the bout and repaid his team mates with his first of the season. Michael Farren had the primary assist finding Hájek through an open seam; Josh Paterson got the monkey off his back picking up the second helper for his first point of the season. Sam Steel answered right back for the home side, but Cameron Hebig quickly restored the Blades lead minutes later. Again, Regina responded via another Anaheim Ducks prospect, this time from d-man Josh Mahura. The fast and furious opening frame continued with a pair of back to back tallies from the Blades. First, Seth Bafaro blasted in his first WHL goal; a power play one-timer set up by Braylon Shmyr. Then Shmyr got one of his own finishing off a give and go play with linemate Cam Hebig. The Pats would add one more before the buzzer to give the Blades a 4-3 lead heading into the first intermission. In the middle stanza, Brad Goethals found the puck on his stick in the slot and spun towards the net to beat Max Paddock glove side making it 5-3 for Saskatoon. Goethals’ 3rd of the season ended Paddock’s night after allowing 5 goals on 14 shots faced. Both teams tightened up giving the red lights a break for most of the period until George King answered for Regina. The rookie 19 year old finished off a pretty passing play by the Pats, again leaving Saskatoon with a one goal lead at the intermission. The backs of the seats were cold for the final twenty minutes in Regina as fans and players alike were on edge. 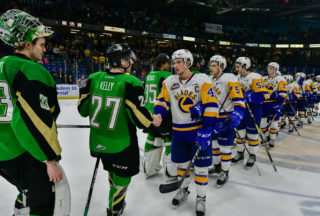 Regina kept pressing looking for the equalizer but the Blades fended off the reigning Eastern Conference Champs and managed to stay out of the box while doing so. Then in the final minute with the net empty, Cameron Hebig sealed the deal with his second goal of the night for a 6-4 final for the Blades. Both Hebig (2G, 2A) and Shmyr (1G, 3A) had four points on the evening with new linemate Brad Goethals (1G, 1A) also enjoying a multi-point game. Ryan Kubic made 27 saves after returning from a two game absence due to injury to pick up his 2nd win as a Blade. 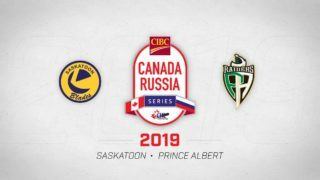 The Blades will now have an off-day Thursday in Regina where they will practice before travelling to Medicine Hat ahead of Friday’s tilt with the Tigers. 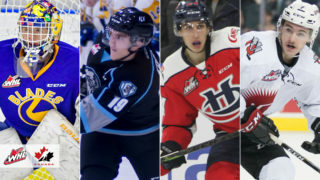 The next Blades home game is on Wednesday, October 18th, when the Vancouver Giants come to town. Click here for tickets or call 306.975.8844 to book your group night or experience package!